Cross the Spree River using the Oberbaum Bridge (Oberbaumbrücke) to experience a piece of Berlin’s history. The first version of the Oberbaumbrücke was a wooden drawbridge built in the 1700s as a gate to the city. The name “Oberbaumbrücke” means literally “Upper Tree Bridge,” referring to the solid wooden tree trunks that were used as boom gates to blockade the river at night. The double-decker Oberbaumbrücke you see today was opened in 1896. Check out the two distinctive Gothic-style towers, added as a reference to the bridge’s former use as a gateway. The Oberbaumbrücke offers scenic views across the city and the Spree River. Look northwest to see the historic Berlin Wall and the East Side Gallery murals that now adorn it. Spot the iconic TV Tower (Fernsehturm) rising up from Alexanderplatz. Look southeast to the 98.4-foot (30-meter) steel sculpture Molecule Men in the Spree. American sculptor Jonathan Borofsky created the sculpture to represent the meeting point of the three districts: Treptow, Kreuzberg and Friedrichshain. The bridge was used as a connection between East and West Berlin from 1961 until 1989. West Berlin residents were able to use the walkway as a pedestrian border crossing. After the fall of the wall, the roads and train lines were reopened and a neon installation by Thorsten Goldberg was installed. Spot the neon lights along the bridge’s tower that depict an ongoing game of Stone, Paper, Scissors. Oberbaumbrücke is located in the heart of the Kreuzberg-Friedrichshain borough. Reach the bridge by subway, train and bus. It is open daily and can be crossed for free. The bridge is near to Kreuzberg’s lively café district and Friedrichshain’s exciting nightlife area. Walk over the bridge in the evening to enjoy concerts played by street performers. Taken you forever to make it to this renowned attraction? Then you can't head home without trying out a Berlin Today Half-Day Walking Tour. For more activities, examine our Berlin things to do page. Enjoy the old-world atmosphere of this elegant square, which is bordered by two cathedrals and a grand concert hall. Bring along euros to purchase designer goods and alternative fashions at one of the most interesting shopping districts in the city. Receiving both architectural and acoustic acclaim, this concert hall in the Kulturforum district is the best place to see the Berlin Philharmonic Orchestra. Stroll along the Spree River, check out the Soviet War Memorial or jump onboard a sightseeing boat ride from this leafy public park in Alt Treptow. A variety of exceptional opera productions are staged in the hallowed halls of this Prussian treasure, which has been rebuilt tree times during its 250-year tenure. Take in breathtaking views of Berlin and enjoy a meal in a revolving restaurant inside the sphere of this iconic tower, the tallest structure in Germany. Explore the city center campus of this famous educational institution, which has nurtured some of the greatest minds in history. Admire the architecture of this grand concert hall and listen to an orchestral performance in the lavish auditorium. Learn about life in ancient Europe and marvel at antiquities from the Greek and Roman eras in this grand neoclassical building on Berlin’s Museum Island. Take in views of the Brandenburg Gate and the edge of sprawling Tiergarten park from this expansive and handsome public square. Eat a picnic, go cycling or attend outdoor festivals in this former airport turned public park, one of the largest communal areas in the city. Learn about Germany’s compelling history through this vast collection, which takes an honest and unflinching look at this modern European nation. The white and shining headquarters of federal government on the banks of the River Spree is a testimony to the newest chapter in German history. This church dates back to Berlin’s medieval beginnings. It’s now one of the city’s great museums. Named for its ornate dome, this beautiful 18th-century tower within Mitte’s Gendarmenmarkt is a great place to see sweeping views across the city. Look for the distinct red-brick building in the central district of Mitte to see where Berlin’s mayor works. Inside, tour the ornately decorated rooms and interesting historical exhibitions. Once a royal garden, this elegant public park is now a perfect resting and picnic spot for city explorers. Discover a lesser-told story from Berlin’s history at this unique memorial to fallen Soviet soldiers, set in the lush grounds of the Tiergarten. Torched by Hitler, bombed by Britain and stormed by the Russians, the seat of German power has risen again as a symbol of a united and progressive Germany. A serene outdoor museum traces the history of one of the 20th-century's most infamous constructions. A journey through the art and culture of nearly 6,000 years of civilization is as simple as a visit to this world heritage listed island. Say “guten tag” to some of the world’s most exotic creatures in one of Europe’s most comprehensive and elegant zoos. This architectural gem is a bold but peaceful tribute to the millions of Jews who lost their lives during the Holocaust. Berliners come to celebrate their city in this public square, which was leveled during World War II and isolated in the Cold War. This symbol of German unification ranks alongside Paris' Arc de Triomphe as one of Europe’s most iconic and emotive monuments. An indoor water feature like no other, this huge cylinder filled with marine life brings the oceans to the center of Berlin. Leaf through original Communist school books and put your ear to secret police listening devices at this truly hands-on museum. Feel like royalty for a day in one of Europe’s grandest palaces, which was almost 200 years in the making. Once a point of tension and dramatic escape attempts, this Cold War relic is now one of Berlin's biggest tourist attractions. This 18th-century square in the heart of the central district of Mitte has an opera house, cathedral and a library and was once the site of a Nazi book-burning event. Admire this magnificent neoclassical palace built for a Prussian prince in 1786 in the leafy Tiergarten, which today holds the official seat for the German president. The ruins of a Protestant church stand next to a modern place of worship, creating a scene that captures the destruction, and the regrowth, that comes from war. Don’t leave Berlin without saying hello to Golden Lizzie, the gleaming statue at the top of the city’s best-known landmark. Find an impressive collection of ancient sculptures, Byzantine art and coins from antiquity in this beautiful Baroque Revival building on Berlin’s Museum Island. One of Berlin’s oldest churches, a Gothic medieval building in the heart of the central district of Mitte, holds an immense fresco called The Dance of Death. Cutting through Berlin’s Mitte district is a street known equally for its Cold War history and its upmarket department stores. Not yet as obvious as some of Berlin’s other major entertainment precincts, Torstrasse is rapidly becoming Mitte’s hub for fashionable restaurants and bars. Often described as “Berlin’s Champs-Élysées,” this elegant promenade is the city’s premier shopping strip and is punctuated with a moving war memorial. Admire the superbly symmetrical design of this Renaissance-style palace commissioned by King Friedrich Wilhelm IV as a tribute to the beauty of New Garden. The Hohenzollern dynasty’s last palace is a historical treasure with a story that is entwined with the fall of the Prussian Kingdom and the end of World War II. Snap photos of this awe-inspiring artwork depicting humans filled with hundreds of holes that represent the molecules that create us. Berlin’s most popular museum houses ancient monuments and epic buildings dating back more than 2,000 years. Discover the architectural treasures and landscaped gardens of this expansive parkland between the Heilige and Jungfern lakes in Potsdam’s northern district. Located in Friedrichshain, this hotel is within a 10-minute walk of Mercedes-Benz Arena and East Side Gallery. Alexanderplatz and TV Tower are also within 2 mi (3 km). Berlin East S-Bahn and Berlin Ost Station are within a 5-minute walk. 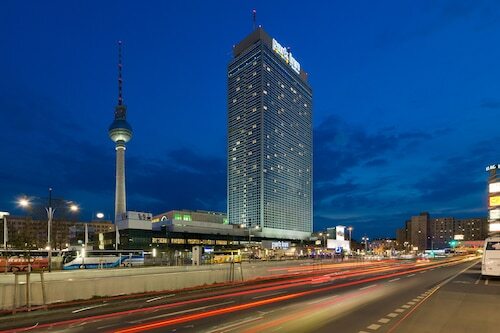 Located in Mitte, this luxury hotel is within a 10-minute walk of Alexanderplatz and TV Tower. Red Town Hall and DDR Museum are also within 15 minutes. Alexanderplatz Station is only a 4-minute walk and Alexanderplatz U-Bahn is 5 minutes. 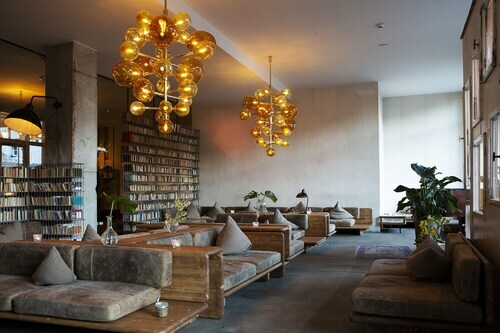 Located in Friedrichshain, this hotel is within a 10-minute walk of East Side Gallery and Mercedes-Benz Arena. Treptower Park and TV Tower are also within 3 mi (5 km). Warschauer Strasse U-Bahn is 8 minutes by foot and Warschauer Straße Station is 10 minutes. 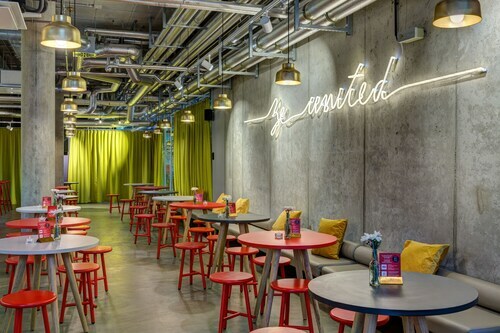 Located in Friedrichshain, this hotel is within a 10-minute walk of Oberbaum Bridge, East Side Gallery, and Mercedes-Benz Arena. Alexanderplatz and TV Tower are also within 3 mi (5 km). Warschauer Strasse U-Bahn and Warschauer Straße Station are within a 5-minute walk. 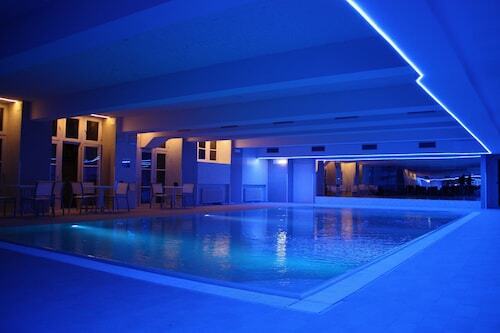 Located in Friedrichshain, this hotel is 1 mi (1.7 km) from Badeschiff. Warschauer Strasse U-Bahn is only a 4-minute walk and Warschauer Straße Station is 8 minutes. Located in Friedrichshain, this hotel is within a 5-minute walk of Oberbaum Bridge and East Side Gallery. Mercedes-Benz Arena and Alexanderplatz are also within 3 mi (5 km). Warschauer Strasse U-Bahn is only a 2-minute walk and Warschauer Straße Station is 3 minutes. Located in Friedrichshain, this hotel is within a 5-minute walk of Mercedes-Benz Arena and East Side Gallery. Alexanderplatz and TV Tower are also within 3 mi (5 km). Warschauer Strasse U-Bahn is 8 minutes by foot and Berlin East S-Bahn is 10 minutes. 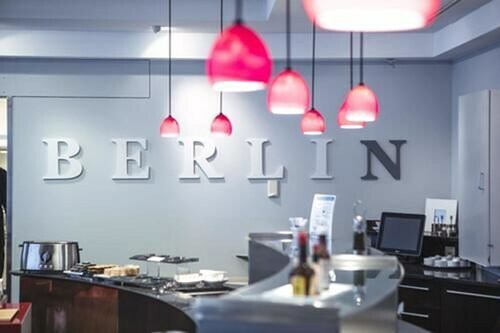 Located in Friedrichshain, this hotel is within 1 mi (2 km) of Oberbaum Bridge, Mercedes-Benz Arena, and East Side Gallery. Alexanderplatz and TV Tower are also within 2 mi (3 km). Strausberger Platz U-Bahn is 10 minutes by foot and Berlin Ost Station is 6 minutes.